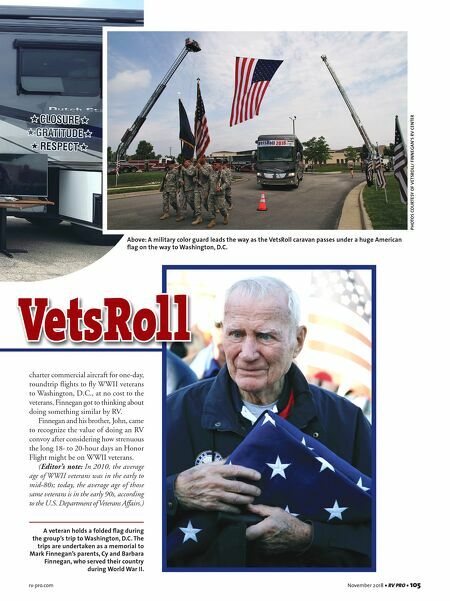 104 • RV PRO • November 2018 rv-pro.com B U S I N E S S A s the child of parents who served their country during World War II, Mark Finnegan has a special place in his heart for members of the Greatest Generation. Motivated to do something on behalf of WWII military veterans and Rosie the Riveters who kept the factories at home humming, the owner of Finnegan's RV Center in 2010 decided to start VetsRoll, which provides tour bus and motorhome tours to Washington, D.C., to view the memorials built in their honor. The catalyst for VetsRoll came to Finnegan in 2009, after being asked to help with another assistance project: Company representatives with ABC- TV's Extreme Makeover Home Edition asked if the South Beloit, Ill.-based dealership could supply RVs for the TV cast to stay in during a home rebuild in northwest Illinois. "We didn't know too much about it, but we were happy to do it. What we were doing was helping the folks from Hol- lywood stay comfortable in a cornfield, but we weren't helping the family (whose home was being renovated), so we asked if we could do a fundraiser," Finnegan says. "It was Friday afternoon and they were wrapping the shoot on Wednesday. We ran back to the dealership and got on the phones and emailing asking for $100 donations. We raised $12,000 by Wednesday. It was the beginning of the Great Recession, but it told us that if the cause is right people will still give." Right Cause, Right Time That experience led Finnegan and his family to ponder other ways they could be of service. 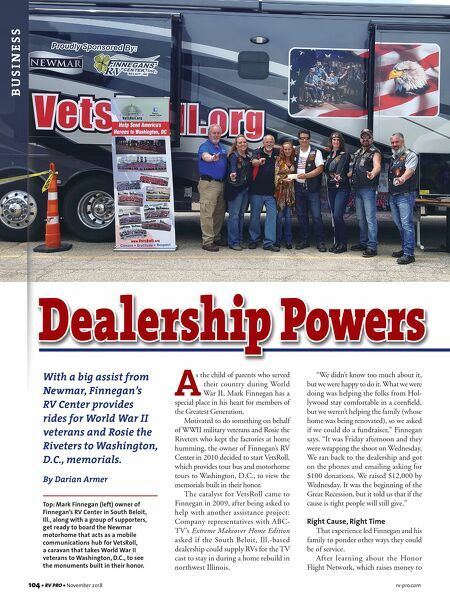 After learning about the Honor Flight Network, which raises money to With a big assist from Newmar, Finnegan's RV Center provides rides for World War II veterans and Rosie the Riveters to Washington, D.C., memorials. By Darian Armer Dealership Powers Top: Mark Finnegan (left) owner of Finnegan's RV Center in South Beloit, Ill., along with a group of supporters, get ready to board the Newmar motorhome that acts as a mobile communications hub for VetsRoll, a caravan that takes World War II veterans to Washington, D.C., to see the monuments built in their honor.